Ceramic and pewter cereal bowl. EXCLUSIVELY AT NEIMAN MARCUS Hand-painted pattern based on a typical Portuguese design from the 17th century. Glazed earthenware made in Portugal. Dishwasher safe. 6.5"Dia. x 3"T.
Ceramic stoneware bowl. 6"Dia. x 3"T; holds 18 oz. Dishwasher, freezer, oven, and microwave safe. Made in Portugal. 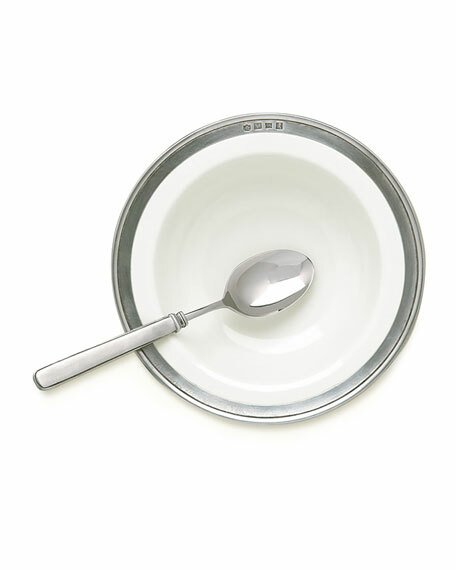 EXCLUSIVELY AT NEIMAN MARCUS Ceramic stoneware cereal/ice cream bowl. Holds 24 ounces. 6"Dia. x 3"T. Oven, microwave, dishwasher, and freezer safe. Made in Portugal. Stoneware cereal bowl. Dishwasher, microwave, oven, and freezer safe. 6.5"Dia. x 2.75"T; holds 16 oz. Made in Portugal of domestic material.